"My husband and I...are self managing our IRA...We love your book. You are the first person to make sense of preferreds." 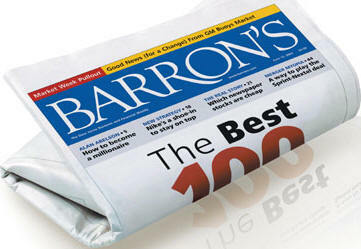 - Gayle S.
A special welcome to all of the new CDx3 Newsletter subscribers from the February 18 Barron's article titled "How To Play Financial Stocks -- Safely." We were pleased to be included in such company. This is your first issue of the CDx3 Newsletter, a free monthly newsletter devoted to the interests of CDx3 Preferred Stock investors. "CDx3 Preferred Stocks" are preferred stocks that meet the ten CDx3 Selection Criteria presented in Chapter 1 of the book Preferred Stock Investing. For example, CDx3 Preferred Stocks must (1) be issued by a company that has never suspended dividends on a preferred stock, (2) have a Moody's rating of "investment grade," and (3) have the "cumulative" dividend provision that, in the event of a missed dividend payment (which I have never seen happen with a CDx3 Preferred Stock), requires the issuing company to make it up to you down stream. And there are seven more criteria beyond these three, all of which must be met in order for a regular preferred stock to be considered a CDx3 Preferred Stock. The ten CDx3 Selection Criteria eliminate about 90% of the preferred stocks that are issued every month, leaving the lowest-risk, highest-quality preferred stocks - CDx3 Preferred Stocks. The Last Month's CDx3 Investor Results article below marks an important event that occurred during February - the annual inflation rate (4.28%) exceeded the average annual interest rate paid by bank Certificates of Deposit (3.7%). Two charts clearly show how this event has generated enormous interest in low-risk CDx3 Preferred Stocks, which are now paying an average dividend rate of 8.1%. The current "buyer's market" for CDx3 Preferred Stocks (high dividend payers available for low market prices) started last June. Much of my research activities last year focused not so much on what was causing the buyer's market (subprime mortgage/credit mess), but rather on developing a method for measuring it. In this month's Special Announcement article, I present the results of that research - the CDx3 Perfect Market Index. The chart that I will present clearly shows how, when and the order of magnitude that the market for CDx3 Preferred Stocks changed during 2007. This month's CDx3 Company Spotlight article uses a CDx3 Preferred Stock issued by Health Care Properties, Inc. (HCP) to illustrate how CDx3 Investors can create a 16.7% opportunity for themselves by buying it now and selling it later. When later? August 15, 2008; and receive two dividend checks from HCP in the mean time. Bonds and preferred stocks have a lot in common, but there are some important differences too. In this month's CDx3 Question Of The Month article, I'll show you how one such difference determines the best time to buy and sell CDx3 Preferred Stocks. When the Federal Reserve Board lowered interest rates in late January, the result for those investing in bank CDs was swift and stunning. The average bank CD interest rate (24 months, $10k) plunged 1.1% during February, leaving CD investors wondering where to turn. The research that I have documented throughout Preferred Stock Investing describes a solid alternative. The Fed meets again on March 18 to consider another rate reduction. If you are a bank CD investor, I strongly encourage you to familiarize yourself with the benefits of low-risk preferred stocks by reading Preferred Stock Investing - written for non-investment experts in plain English. Just click on the Purchase Preferred Stock Investing link at the top of this CDx3 Newsletter. It finally happened. During February, the inflation rate leaped past the average interest rate being paid by bank Certificates of Deposit (CDs). That means that, even before you pay the income tax on the CD's interest, you're losing money. The Consumer Price Index reached 4.28% during January and is expected to be reported at about the same level for February, while the average interest rate on bank CDs (24 month, $10k) fell to 3.7%. While bank Certificates of Deposit (CDs) have their place, what I really object to is that they are promoted to bank customers as some kind of income-generating machine, when the fact is that they are not, and never have been. 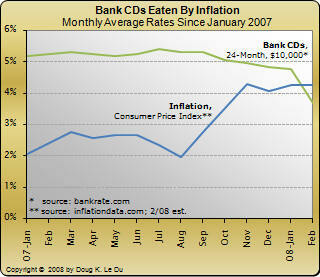 By the time you subtract inflation and income taxes, you are frequently losing money with bank CDs. Example: Say you put $1,000 into a 24-month bank CD that pays the current national average rate of 3.687% per year (source: bankrate.com). So, at the end of the first year you have made $36.87 in interest income. Now let's say you have to pay 40% (federal plus state) of that interest income to taxes, so you lose $14.75 of your $36.87. You're down to $22.12 in earnings so far. But remember, your original $1,000 also loses to inflation over that year. The current 4.28% annual inflation hit on your $1,000 is $42.80. Subtracting that off of your remaining $22.12, and you are upside down by $20.68. That's a $20.68 annual loss for every $1,000 you invest in this bank CD. In the October 2007 issue of the CDx3 Newsletter I explained the relationship between interest rates in the U.S. economy (as managed by the Federal Reserve Board) and inflation. Lowering interest rates is inflationary. The Fed found themselves in a tough spot last summer, having to choose between lowering rates to help out the cash-starved financial markets or fighting off inflation. The Fed sided with the financial markets and began lowering interest rates; inflation predictably started upward. Now For The Good News: Normally, there is some consistency between the movement of various interest rates within the U.S. economy. But, at the moment, we are in exceptional times; times that have created an enormous opportunity for CDx3 Investors. The average annual dividend rate now being paid by newly issued CDx3 Preferred Stocks is now more than double the average bank CD interest rate (24 months, $10k). And that's just the dividend income (paid to you quarterly by CDx3 Preferred Stocks). Preferred Stock Investing teaches you how and when to capture additional capital gain income as well, which is another advantage over bank CDs. 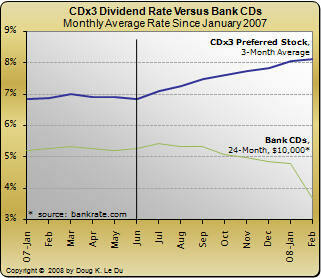 Notice how, prior to June 2007, CDx3 Preferred Stock dividend rates (top line) and bank CD rates were moving more or less together, as usual. When the Fed started lowering interest rates, CDs followed along, but not CDx3 Preferred Stocks. In fact, the lower the Fed pushed interest rates, the higher the dividend rates being paid by CDx3 Preferred Stocks went. And that is likely to continue to be the case for many more months. Why? CDx3 Preferred Stocks: To understand why, one has to understand the reason that the Fed has been lowering interest rates. The reason, of course, is because the financial sector of our economy, and everything attached to it, is under enormous pressure. To help out, the Fed has been lowering the cost of money (rates); but, at the same time, cash-strapped banks have had to sweeten the deal on new CDx3 Preferred Stocks in order to attract investors (you). So, a set of circumstances has presented itself where interest rates are low (and getting lower), while, at the same time, dividend rates being paid by newly issued CDx3 Preferred Stocks are increasing. February Action: The three-month average dividend rate being paid by newly issued CDx3 Preferred Stocks continued to increase during February, reaching an annual rate of 8.142%. Up from January's 8.075% mark, CDx3 Preferred Stocks continue to outpace most other low-risk, fixed-income investments, such as bank CDs. Low-Risk? What makes CDx3 Preferred Stocks such low risk? CDx3 Preferred Stocks meet the ten CDx3 Selection Criteria presented in Chapter 1 of Preferred Stock Investing. Three of the ten criteria that CDx3 Preferred Stocks must meet are that they (1) are issued by a company that has never suspended dividends on a preferred stock, (2) are rated "investment grade" by Moody's Investors Service and (3) are "cumulative," meaning that if a dividend is skipped, the issuing company is obligated to make it up to you later. How To Get Started: Preferred Stock Investing provides the resources (formulas, web sites, techniques) that you need to be a successful CDx3 Investor. For those who would rather not take the time, but still want the benefits, there is the CDx3 Notification Service. In addition to having direct access to my ongoing research, their own web site with tons of preferred stock investing resources and a separate monthly preferred stock research newsletter, subscribers to the CDx3 Notification Service receive an email message whenever there is an upcoming buying or selling opportunity for CDx3 Preferred Stocks; weeks in advance too. If you are a CD investor looking for an alternative, I would encourage you to read Preferred Stock Investing and consider subscribing to the CDx3 Notification Service. The Federal Reserve Board meets to consider lowering rates again on March 18. In early February, new research was presented to subscribers to the CDx3 Notification Service that is able to quantify the behavior of the market for CDx3 Preferred Stocks. With the new "CDx3 Perfect Market Index," CDx3 Investors can now actually see on a chart the direction and strength of the market for CDx3 Preferred Stocks. A value above 100 indicates a "buyer's market" while a value below 100 indicates a "seller's market" (100 indicates a "perfect market"). The CDx3 Income Engine takes advantage of a well known characteristic of the market for preferred stocks - the direction of dividend rates and market prices move in opposite directions. This is what Preferred Stock Investing refers to as the Rule of Rate/Price Opposition (page 61) - rates up, prices down, and vice versa. High Dividend Income Now: If you have been reading the CDx3 Newsletter for the past several months, you have seen my references to the "buyer's market" that we entered last June. A buyer's market is characterized by the availability of unusually high dividend paying CDx3 Preferred Stocks at unusually low market prices. It is during a buyer's market that CDx3 Investors focus on scooping up these high dividend payers; the CDx3 Income Engine generates relatively high dividend income during such market conditions. Plus Capital Gain Income Later: Conversely, during a "seller's market" CDx3 Preferred Stock dividend rates are falling, but market prices climb. This is when CDx3 Investors sell, for a nice capital gain, the CDx3 Preferred Stocks that they had purchased earlier during the buyer's market. For this reason, during a seller's market, the CDx3 Income Engine favors capital gain income, rather than dividend income. For CDx3 Investors, it is therefore important to know which direction the market for CDx3 Preferred Stocks is heading in. Are more buying opportunities on the way, or should we be looking for selling opportunities on the horizon? No More Guessing: The CDx3 Perfect Market Index takes the guessing out of determining the nature of the market for CDx3 Preferred Stocks. 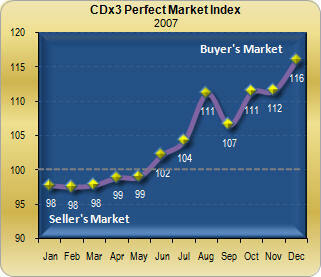 The CDx3 Perfect Market Index is updated each month and provided to subscribers to the CDx3 Notification Service. To learn more about becoming a subscriber, click here. In last month's issue of the CDx3 Newsletter, I described how CDx3 Preferred Stocks have a five year lifespan due to their five year "call date." After five years from introduction, the issuing company of a CDx3 Preferred Stock regains the right to purchase your shares back from you, but they must pay you $25.00 per share, regardless of what you originally paid and regardless of the then-current market price. $25.00 - that's what you're going to get. As you might guess, knowing what the price is going to be way in advance provides CDx3 Investors with an opportunity. If you purchase a CDx3 Preferred Stock for less than $25.00, and it is "called" (bought back from you) by the issuing company, you not only make great quarterly dividend income along the way, but you realize a profit (capital gain) on the call date to add to your dividend earnings. Example: I will use a CDx3 Preferred Stocks from HCP, Inc. to illustrate how this works, then you can decide if, within the context of your resources, goals and risk tolerance, this approach is for you. If nothing else, I think you will agree that this mechanism is very interesting. But first, a little bit about HCP. 70 million Americans started retiring last year. That's almost one out of every four people. Health care, the largest single sector within the U.S. economy, is about to get a lot bigger. HCP, founded in 1985, invests in health care-related facilities by purchasing them and leasing them to health care providers. HCP, a $6.2 billion company headquartered in Long Beach, California, owns about $11 billion worth of facilities used for senior housing, medical offices, life sciences, hospitals and skilled nursing centers throughout the United States and Mexico. By looking back five years, CDx3 Investors can see CDx3 Preferred Stocks that are now candidates for being called. HCP issued two CDx3 Preferred Stocks during 2003, HCP-E (7.25%) and HCP-F (7.10%). Let's talk about HCP-E.
August 15, 2008: HCP-E has a call date of August 15, 2008. As explained in last month's issue of the CDx3 Newsletter, if the average dividend rate being paid by newly issued CDx3 Preferred Stocks falls from its current level of 8.1% down below 7.25% by August, it would be unusual for HCP not to call (buy back from you at $25 per share) HCP-E.
As I am writing this, HCP-E is selling for a market price of $23.12. If you were to purchase HCP-E at that price, your yield (the rate that you are actually earning on the money you have invested) would be 7.84%, not 7.25%. HCP-E pays its quarterly dividends using the calendar quarter, so you are going to receive two quarterly dividend payments (March 31 and June 30) from HCP prior to the August call date. At $0.45 per quarter, that's $0.90 in dividend income per share to you. Secondly, if HCP calls HCP-E on August 15, 2008 (and pays you $25 per share), you would realize a capital gain of $1.88 per share (the $25.00 they'll pay you minus the $23.12 you paid today). So, prior to the August 15 call date, you make $0.90 in dividend income plus $1.88 in capital gain income (assuming that HCP calls HCP-E; if not, you just keep collecting more dividend income each quarter at 7.84% until they do). 16.7% EAR? CDx3 Investors who purchase HCP-E now for $23.12 per share, would collect two quarters worth of dividend income, then sell back to HCP in August for $25 per share, earning an effective annual return of 16.7% on their money. 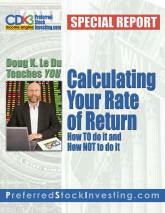 If HCP waits a year to call HCP-E (until August 2009), your effective annual return is still 11.6%. Please do not take my use of HCP-E here as a recommendation to buy, or not to buy. HCP-E provides a great example of how CDx3 Investors can use the call date to their advantage. So where can you find a list of CDx3 Preferred Stocks that were issued during 2003 and now face an upcoming call date? Preferred Stock Investing, page 129 lists all 21 of them including their trading symbols and dividend rates. When I purchase a CDx3 Preferred Stock, do I get to keep the entire quarterly dividend or do I have to split it with the seller like bonds? - Marilyn P.
In the CDx3 Company Spotlight article above, I explain how CDx3 Investors can use the characteristics of CDx3 Preferred Stocks to position themselves for a nice return. Using an approaching call date during a buyer's market to collect nice dividend income plus a capital gain should the issuing company call (buy back from you) your shares. But there are many more aspects of preferred stock investing that allow CDx3 Investors to (1) earn respectable returns with (2) very little risk or (3) work - the three objectives of the CDx3 Income Engine as explained throughout Preferred Stock Investing. Marilyn's question is one that I frequently receive from those who have experience investing in bonds. Once I explain the answer, you will see what an incredible opportunity exists with CDx3 Preferred Stocks. Similarities: Bonds are often compared to preferred stocks since both can offer a low-risk investment alternative. They both pay a fixed, periodic dividend and both bond holders and preferred stock holders get to stand in line before common stock holders in the unlikely event that the issuing company has a meltdown. Differences: Bond dividends are usually paid every six months as compared to the quarterly dividends paid by CDx3 Preferred Stocks. But there is a major difference between the rules governing bond dividends and those governing CDx3 Preferred Stock dividends, a difference that adds substantial fuel to the CDx3 Income Engine. Here's The Deal With Bonds: Let's say that you purchase a bond two months into its six month dividend period; that is, the seller owns this bond for two months and then you own it for four months. When the issuing company pays the dividend for that six month period, they send the money to your broker. Your broker is required to then send one-third of that dividend cash back to the seller's broker. In other words, with bonds, you only get to keep the amount of dividend income that is proportional to the amount of time you owned the bond during the dividend period. There is a "post-sale reconciliation" that goes on between your broker and the broker of the person who sold the bond to you. You Keep The Money: Now compare that to the case of CDx3 Preferred Stock dividends. Each quarter, the stock exchange announces a magic date (called the Ex-Dividend Date), just prior to when the quarter's dividends are paid out. With CDx3 Preferred Stocks, whoever owns the issue on the morning of the Ex-Dividend Date will receive the dividend for that quarter from the issuing company - and you get to keep it; all of it. That's right; with CDx3 Preferred Stocks, there is no "post-sale reconciliation." Even if you were to purchase the CDx3 Preferred Stock one day prior to the Ex-Dividend Date, you will receive the entire quarter's worth of dividend income. As you might guess, this characteristic of CDx3 Preferred Stocks creates quite an opportunity for those "in the know." Preferred Stock Investing provide all of the formulas, methods, web sites and other resources that you need to be a successful CDx3 Investor entirely on your own. But for those who would rather not take the time, subscribers to the CDx3 Notification Service receive an automatic email message whenever there is an upcoming buying or selling opportunity, the timing of which is often known well in advance. With bonds, there is no such opportunity due to the post-sale reconciliation of dividends; with CDx3 Preferred Stocks, there is substantial opportunity with little risk or work. Thanks to Marilyn P. for the great question. You will receive a complementary copy of the CDx3 Special Report Dividend Accounting. The average interest rate (APY) paid by bank CDs (24 months, $10k) fell from January's 4.8% to 3.7% by the end of February (source: bankrate.com); a drop of more than 1% in one month. This drop was largely due to the aggressive reduction in interest rates by the Federal Reserve Board during late January. The Fed is scheduled to meet again to consider another rate reduction on Tuesday, March 18. If you would like to place a wager on which way the Fed will go, and by how much, the Chicago Board of Trade offers a "futures market" where you can do just that. At the moment, the smart money says that the Fed will lower the federal funds rate by 1/2 percent on March 18. In that event, the interest rate on bank CDs will likely drop even further and inflation will receive another upward boost - perfect conditions for an increase in demand for CDx3 Preferred Stocks. Don't be left out of these unique circumstances. Subscribers to the CDx3 Notification Service receive a Buyer's Notification email message when there is an upcoming buying opportunity, and a Seller's Notification message when there is an upcoming selling opportunity. We do all of the work for you. Be on the receiving end. I will report the Fed's actions, and what it means to CDx3 Investors, back to you in next month's issue of the CDx3 Newsletter.